Dave Sweeney is one of the key voices in Australia educating people about the environmental and public health dangers of uranium mining. Sweeney works with the Australian Conservation Foundation, a 40-year-old organization that liases with the community, business and government to protect and sustain the Australian environment. In this interview with Dr Caldicott, Sweeney talks about the plans that are underway for a massive expansion of the uranium industry in Australia, and the push to build the first Australian nuclear power plants. The show starts off by examining the history of uranium mining in Australia, and the lack of remediation for the toxins that are released in processing uranium. Sweeney talks about Aboriginal myths and wisdom, their claims on the land used to mine uranium, and how Aboriginal homes have become missile and rocket testing ranges. Read Aboriginal cancer doubles near uranium mine. 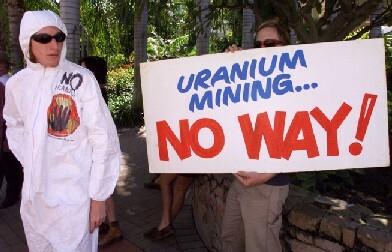 Promoters of uranium mining, Sweeney notes, are saying that Australia could become the “Saudi Arabia of the Nuclear Age.” Sweeney works with activist groups to teach Australians that uranium mining is far more dangerous than extracting any other mineral. He and Dr. Caldicott delve deeply into the lack of concern by media and politicians about the horrific health and environmental consequences of such a deadly material, which is used to make “the worst weapons in the world.” Sweeney says there is much “institutional denial” and a “sanitized view” about uranium as well as nuclear power. The program looks at the proposal to build the world’s largest mine, Roxby Downs, to mine uranium and triple exports. Several groups have been working to block this dam and the destruction it would create, including the Australian Conservation Foundation, Roxstop, and Friends of the Earth Australia. Dr. Caldicott mentions the enormous electricity usage and CO2 emissions such a mine would necessitate. July 14 article Rudd defends uranium mine decision, both of which quote Dr. Caldicott. There is enormous potential to use only green and renewable energy in Australia, with the country’s vast solar, wind, geothermal and other reserves. Read Australia: the Saudi Arabia of solar? Yet today, Australia is still locked into a “quarry economy.” Australia is a major coal exporter, and coal and uranium profits are enormous. Dr. Caldicott asks Sweeney about the railway line built between Adelaide and Darwin to transport uranium from the south to the north coast of Australia. She has him outline the purpose of the Global Nuclear Energy Partnership (GNEP), which former president George W. Bush strongly supported. Read more about the hazards of GNEP here. Sweeney describes the Australian Nuclear-Free Alliance, and explains how Australia could become nuclear-free like New Zealand. In closing, Dr. Caldicott says that “either money will determine the fate of the Earth, or morality.” Tune in to realize just how critical uranium mining is in perpetuating the nuclear dangers that continue to haunt the planet. This entry was posted on Monday, July 6th, 2009 at 12:00 am	and is filed under Uncategorized. You can follow any responses to this entry through the RSS 2.0 feed. Both comments and pings are currently closed.